This name uses Spanish naming customs: the first or paternal family name is García and the second or maternal family name is Bernal. Gael García Bernal (Spanish pronunciation: [ɡaˈel ɣarˈsi.a βerˈnal]; born 30 November 1978) is a Mexican film actor, director, and producer. He founded Canana Films in Mexico City. He is mostly known for his performances in the films Bad Education, The Motorcycle Diaries, and Babel, and in Amazon Studio's web television series "Mozart in the Jungle". In 2016, Time Magazine named him in the annual Time 100 most influential people list. 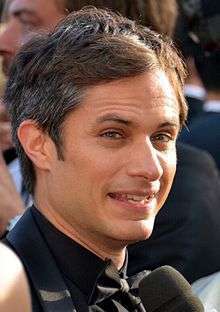 Gael García Bernal was born in Guadalajara, Mexico, the son of Patricia Bernal, an actress and former model, and José Ángel García, an actor and director. His stepfather is Sergio Yazbek, whom his mother married when García Bernal was young. He started acting at just a year old and spent most of his teen years starring in telenovelas. When he was fourteen, he taught indigenous peoples in Mexico to read, often working with the Huichol people. At the age of 15, he took part in peaceful demonstrations during the Chiapas uprising of 1994. García Bernal was becoming a soap opera heartthrob. In 2000, Mexican director Alejandro González Iñárritu offered him a part in the Oscar-nominated Amores Perros. Subsequently, he has starred in several films, including 2001's Y tu mamá también and El crimen del Padre Amaro (2002). He has also done some theatre work, including a 2005 production of Bodas de Sangre, by Federico García Lorca, in the Almeida Theatre in London. García Bernal also portrayed Argentine revolutionary Che Guevara twice, first in the 2002 TV miniseries Fidel and then, better known, in The Motorcycle Diaries (2004), an adaptation of a journal the 23-year-old Guevara wrote about his travels across South America. García Bernal has worked for acclaimed directors including Pedro Almodóvar, Walter Salles, Alfonso Cuarón, Alejandro González Iñárritu, Michel Gondry, and Iciar Baillin, among others. He has taken on roles in English-language films, including the Gondry-directed The Science of Sleep, the Alejandro González Iñárritu's Babel, and The King, for which he earned rave reviews. He was nominated for a BAFTA in 2005 for Best Performance by an Actor in a Leading Role for The Motorcycle Diaries. In 2007 he was also a member of the jury of the 57th Berlin International Film Festival. García Bernal directed his first feature film, Déficit (2007). García was cast for the 2008 film Blindness, an adaptation of the 1995 novel of the same name by José Saramago, winner of the Nobel Prize, about a society suffering an epidemic of blindness. As in the novel, the characters have only descriptions, no names or histories; while director Fernando Meirelles said some actors were intimidated by the concept of playing such characters, "With Gael, he said, 'I never think about the past. I just think what my character wants.'" García Bernal again paired with Diego Luna in Rudo y Cursi directed by Carlos Cuarón. García Bernal and Diego Luna own Canana Productions. The company recently joined with Golden Phoenix Productions to produce a number of television documentaries about the unsolved murders of more than 300 women in the border city of Ciudad Juarez. In May 2010, García Bernal did a cameo appearance as himself, playing Cristiano Ronaldo in Ronaldo: The Movie for the Nike advertisement, Write the Future. In 2010, he co-directed with Marc Siver four short films in collaboration with Amnesty International. This tetralogy is called "Los Invisibles" about migrants from Central America in Mexico, their journey and risks, their hopes, and what they can contribute to Mexico, the US and the world. He directed the movies, did the interviews and also narrates the four short movies. He starred in Even the Rain (2010), the official Spanish entry for the Academy Awards. García Bernal narrated Human Planet for Hispanic audiences, which premiered on Discovery en Español on 25 April 2011 and aired on Discovery Channel in Latin America on May 12. For the third time García Bernal appeared with Diego Luna in the American Spanish-language comedy film Casa de Mi Padre, opposite Will Ferrell, where he played a feared drug lord. García Bernal's next projects include a film adaptation of José Agustín's Ciudades Desiertas and the Jon Stewart directorial biopic Rosewater, in which he portrayed Maziar Bahari to widespread critical acclaim. He starred in the 20th Century Fox reboot Zorro film called Zorro Reborn. The script is by Glen Gers, Lee Shipman, and Brian McGeevy. In 2014, he was cast in the lead role of Rodrigo in the Amazon Studios comedy-drama television series Mozart in the Jungle. His performance in the show was met with rave reviews, earning him a Golden Globe Award in 2016. In 2016 he starred in 2 movies selected to enter competition for the Academy Award's Best Foreign Language Film Award - Desierto (Mexico) and Neruda (Chile). Gael García Bernal was with his partner, Argentine actress Dolores Fonzi, from 2008 to 2014. They met on the set of "Vidas privadas" in 2001. They never married, contrary to media reports according to an interview given by Gael Garcia Bernal in Elle magazine. On Thursday, 8 January 2009, their son Lázaro was born in Madrid, Spain. Their daughter Libertad was born on 4 April 2011, in Buenos Aires, Argentina. The couple ended their relationship in September 2014. He divides his time between Buenos Aires and Mexico City. Gael García Bernal helped to create the organization and film festival Ambulante A.C., which works to bring documentary films to places where they are rarely shown, and helped to create the Amnesty International Short Documentary Series Los Invisibles. For this work, he was awarded the Washington Office on Latin America's Human Rights Award in 2011. ↑ "Gael García Bernal: he plays everybody's favorite revolutionary onscreen, but he's not just playacting, Interview". ↑ Binoche, Juliette (November 2004). "Gael García Bernal: he plays everybody's favorite revolutionary onscreen, but he's not just playacting". Interview. Retrieved 2007-08-14. ↑ "Gael García Bernal". Then It Must Be True. July 2004. Retrieved 2007-08-14. ↑ Calhoun, Dave (2006-04-25). "Gael García Bernal interview". Time Out London. Retrieved 2007-08-14. ↑ Louie, Rebecca (2006-05-26). "Gael García Bernal breaks barriers and tackles tough issues". New York Daily News. Archived from the original on 2006-06-14. ↑ Miranda, Carolina A. (2007-03-02). "Q&A with Gael García Bernal". Time. ↑ "Fall Movie Summer Preview, September: Blindness." Entertainment Weekly, Iss. #1007/1008, August 22/29, 2008, pg.55. ↑ "Watch the Invisibles". Amnesty International. November 8, 2010. ↑ Benzine, Adam (13 April 2011). "Gael García Bernal to voice Hispanic "Planet"". realscreen. Retrieved 19 April 2011. ↑ Buchanan, Kyle (14 April 2011). "Will Ferrell's Spanish-Language Movie: ¿Qué?". New York Magazine. Retrieved 19 April 2011. ↑ White, James (May 22, 2013). "Gael Garcia Bernal Starring In Rosewater". Empire. ↑ Sneider, Jeff (February 16, 2012). "Garcia Bernal to mark Fox's 'Zorro Reborn'". Variety. ↑ "The Jury of the 67th Festival de Cannes". Cannes. Retrieved 28 April 2014. ↑ "Gael Garcia Bernal: The Intellectual Woman's Hearththrob". elle.com. 17 September 2014. Retrieved 19 September 2014. ↑ "Hija de Gael García nacio en Buenos Aires". noticiaaldia.com. 10 April 2011. Retrieved 19 April 2011. 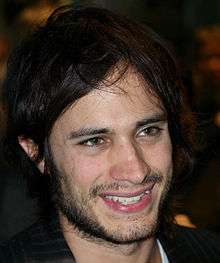 ↑ "Mexican actor Gael Garcia Bernal confirms split from long-term love Dolores Fonzi... but reveals they NEVER married". Mail Online. 19 September 2014. Retrieved 12 February 2014. ↑ "Ambulante A.C.". Ambulante A.C. 1 June 2012. Retrieved 1 June 2012. ↑ "Crossing Mexico: A Journey Of Grave Perils". NPR. 15 September 2012. Retrieved 1 June 2012. ↑ "WOLA's Human Rights Awards". Washington Office on Latin America. 20 September 2011. Retrieved 1 June 2012. ↑ Scholz, Pablo O. (2003). "El cine es para viajar y hacer amigos". El Universal (Caracas) (in Spanish). Archived from the original on 3 February 2013. Retrieved 3 February 2013. ↑ "The BAFTA Award Nominations". Daily Mail. Wikimedia Commons has media related to Gael García Bernal.